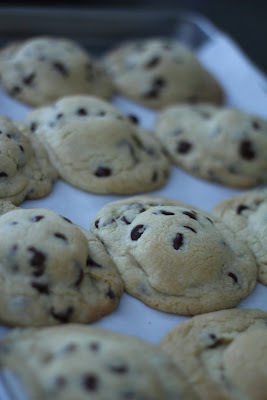 A few bloggers have been passing around a recipe for chocolate chip cookies that are baked around Oreos. I've been waiting to give them a try because I knew that if they stayed in the house...with me...alone...well, I wouldn't be able to fit through any of our doorways. Since we were going to Toronto and visiting lots of peeps, I thought I'd give them a try. This is everything you'll need. If you want to take it up a notch, get some vanilla beans and put them in a sealed container overnight with the sugar. Can't take credit for the idea but I REAP the REWARDS. Mix everything together until JUST combined. Take a heaping tablespoon and form it into a pressed ball. Put one underneath the Oreo and one above. Then squish the seams together, completely covering the Oreo. The recipe says you get 2 dozen. I got just shy of that. As you can see, some of the cookies had slightly too much batter. Marc said they looked like fried eggs...with an oreo centre, of course. I got better with the second batch. BAM! They're friggin' INSANE! It's like THREE cookies at once! VERDICT: They are amazing and best served with a glass of cold milk. Super easy and would make a VERY appropriate gift for someone, considering their intensity on the cookie-scale is about a 10.5. I drooled looking at these pictures . . . had to get a new keyboard. I think this might be the first blog recipe I'll ever try.